And they were exceedingly sorrowful, and began every one of them to say unto Him, Lord, is it I? Now before the Passover Festival, Jesus realized that His hour had come to leave this world and return to the Father. Having loved His own who were in the world, He loved them to the end. By supper time, the devil had already put it into the heart of Judas, the son of Simon Iscariot, to betray Him. Jesus, knowing that the Father had given all things into His hands, and that He had come from God and was returning to God, got up from the table, removed His outer robe, and took a towel and fastened it around His waist. Then He poured some water into a basin and began to wash the disciples' feet and to dry them with the towel that was tied around His waist. Then He came to Simon Peter, who said to Him, "Lord, are You going to wash my feet?" Jesus answered him, "You do not realize now what I am doing, but later on you will understand." Peter said to Him, "You must never wash my feet!" Jesus answered him, "Unless I wash you, you have no part with Me." Simon Peter said to Him, "Lord, not just my feet, but my hands and my head as well!" Jesus told him, "The person who has bathed does not need to wash, except for his feet, but is entirely clean. And you men are clean, though not all of you." For He knew who was going to betray Him. That's why He said, "Not all of you are clean." When He had washed their feet and put on His outer robe, He sat down again and said to them, "Do you realize what I have done to you? You call me Teacher and Lord, and you are right because that is what I am. So if I, your Lord and Teacher, have washed your feet, you must also wash one another's feet. For I have given you an example, so that you may do as I have done to you. Truly, truly I say to you, a servant is not greater than his master, and a messenger is not greater than the one who sent him. If you understand these things, how blessed you are if you put them into practice! I'm not talking about all of you. I know the ones I have chosen. But the Scripture must be fulfilled: 'The one who ate bread with Me has lifted up his heel against Me.' I'm telling you this now, before it happens, so that when it does happen you may believe that I am He. Truly, truly I tell you, the one who receives whomever I send receives Me, and the one who receives Me receives the One who sent Me." After saying this, Jesus was deeply troubled in spirit and declared solemnly, "Truly, truly I tell you, one of you is going to betray Me!" 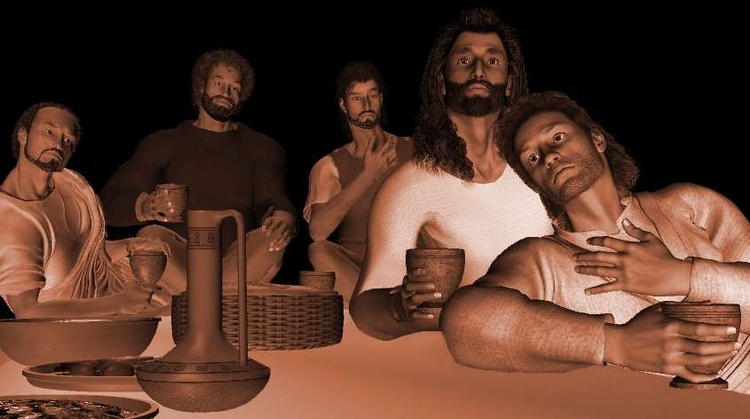 The disciples began looking at one another, completely mystified about whom He was speaking. 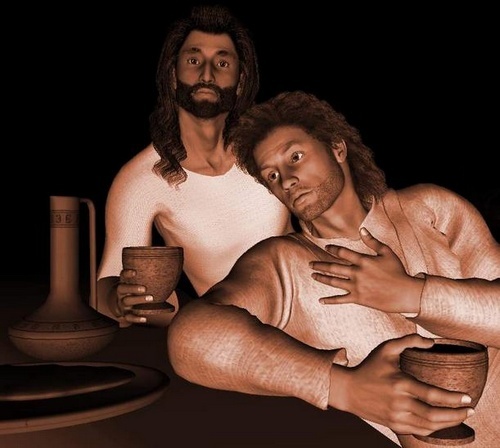 One of His disciples, the one whom Jesus kept loving, was sitting very close to Him. So Simon Peter motioned to this man to ask Jesus of whom He was speaking. Leaning forward on Jesus' chest, he asked Him, "Lord, who is it?" Jesus answered, "He is the one to whom I will give this piece of bread after I have dipped it in the dish." Then He took a piece of bread, dipped it, and gave it to Judas, the son of Simon Iscariot. After he had taken the piece of bread, Satan entered him. Then Jesus said to him, "Do quickly what you are going to do!" Now no one at the table knew why He said this to him. Some thought that, since Judas had the moneybag, Jesus was telling him to buy what they needed for the festival or to give something to the destitute. So Judas took the piece of bread and immediately went outside. And it was night. When he had gone out, Jesus said, "The Son of Man is now glorified, and God has been glorified in Him. If God has been glorified in Him, God will also glorify the Son of Man in Himself, and He will glorify Him at once. Little children, I am with you only a little longer. You will look for Me, but what I told the Jews I now tell you, 'Where I am going, you cannot come.' I am giving you a new commandment to love one another. Just as I have loved you, you also should love one another. This is how everyone will know that you are My disciples, if you have love for one another." Jesus answered him, "I am going where you cannot follow Me now, though you will follow later on." Peter said to Him, "Lord, why can't I follow You now? I would lay down my life for You!" Jesus answered him, "Would you lay down your life for Me? Truly, truly I tell you, a rooster will certainly not crow until you have denied Me three times."